5 AM: on our way from George Town to Pulau Perhentian Besar. 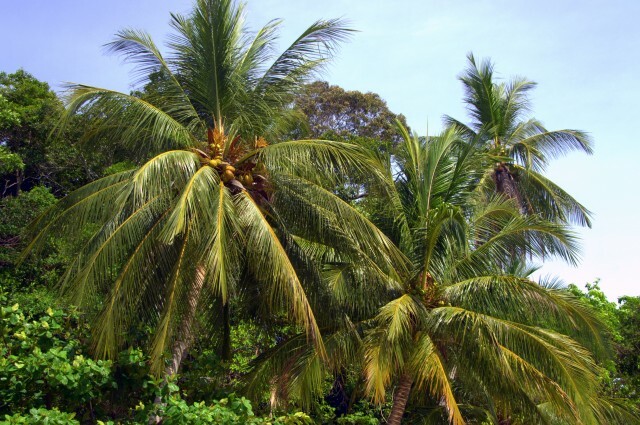 I closed my eyes and saw Gerard Joling (a famous Dutch singer) sing my favorite tropical song everrrr ♫ Gonna buy me a ticket to the TROPICS ♫ We were going to PARADISE! I was ready for a whole lot of sunshine because until that day the weather conditions were (to put it mildly) not very pleasant. It rained every day from 3PM until 7PM and YES the monsoon season was (apparently NOT) over and NO I didn’t travel all the way to Malaysia to have a daily cloudburst! The driver of our fully stuffed (mini mini mini) minivan drove like a lunatic, but we arrived alive and kicking at 11.30AM in Kuala Besut. An hour and a Roti Penang (some sort of banana pancake) later our speedboat picked us up for a 20-minute drive to HEA-EA-VEN! 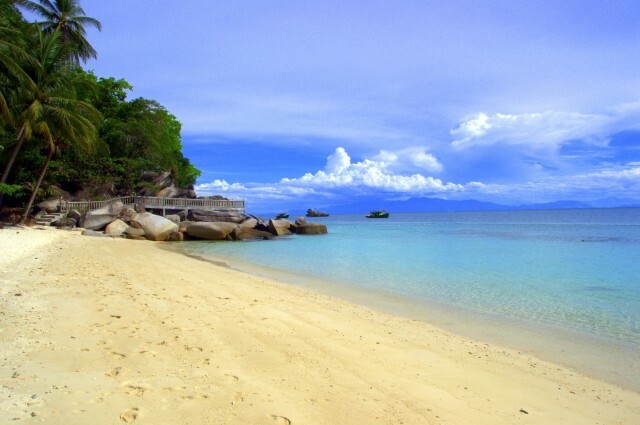 Pulau Perhentian Besar (big island), Pulau Perhentian Kecil (small island) and the uninhabited islands Susa Dara, Serengeh and Rawa are part of the Perhentian Islands, a group of islands 19 km off the north-eastern coast of Peninsular Malaysia. The English translation of Perhentian is ‘stopping point’, a historical reference to the place where traders between Bangkok and Malaysia made a stop during their long journey or to shelter from the storms. Before tourism popped up and became the main source of income, the island was mainly inhabited by fishermen. Next to that it was one of the islands where many Vietnamese refugees arrived after the Vietnam War in the 1970s. 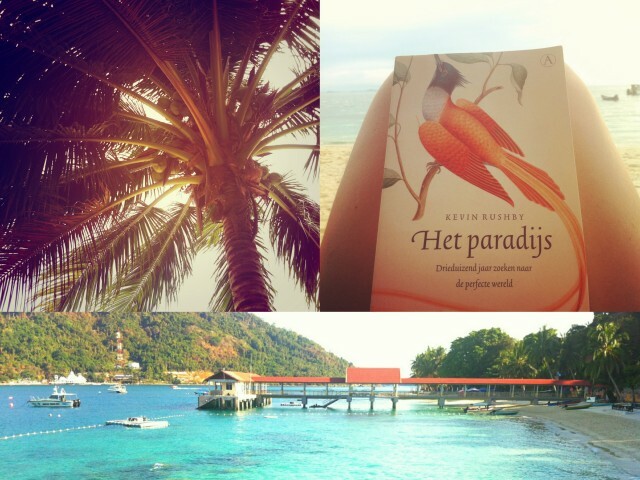 A must read during your stay at the Perhentians or another tropical destination is the book Paradise: A History of the Idea that Rules the World by Kevin Rushby, an historical overview of the different human concepts of paradise. The islands Besar and Kecil are Malaysia’s most pristine getaways surrounded with coconut palm trees and intense white coral sand beaches. Besides taking a jungle trail through the jungle of Besar, you can’t do very much except SUN BAKING (carrot tanning to the max with the beloved Banana Boat deep tanning oil) or pretending like you’re ARIEL the Little Mermaid (my childhood hero!). Go snorkeling (or diving) between the tropical fishes like clown fishes (I found NEMOOOO), blue ring angelfishes, blue-spotted rays, reef sharks, sea turtles and the splendid gardens of coral! The water is so extremely clear and TURQUOISE. You don’t necessarily need to dive to see the complete underwater world, you can also see a lot when you snorkel. View from Pulau Perhentian Besar over the sea. On the right side you already see Pulau Kecil. 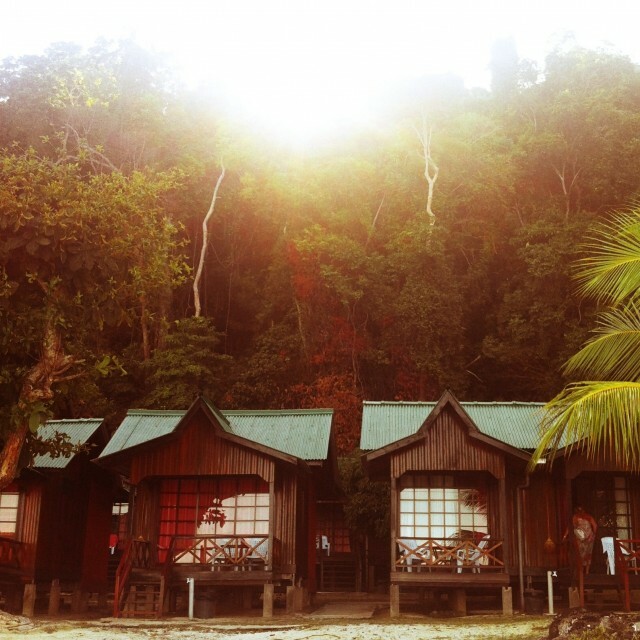 Abdul’s Chalet, Pulau Perhentian Besar. During our 3,5 day stay on Pulau Besar we stayed in Abdul’s Chalet, a basic chalet with air conditioning and a bath room including HOT water (this isn’t always the case in Malaysia). Nothing more, nothing less. Once you open the curtains and step outside it’s SUNSHINE PARADISE! Plus they have the best fruit shakes and banana pancakes for breakfast! For lunch and dinner we went to Tuna Bay Island Resort (100 meters to the left side of Abdul’s Chalet). Not only because of the super tasty Asian (clay pot curry beef!) and Continental foods and fresh sea food barbecue, but it was also one of the only places on the island where they served alcoholic beverages (Malaysia is predominantly Muslim, remember?). One evening we went to Long Beach on Pulau Perhentian Kecil to meet up with our Dutch friends who were on a 4 month backpacking trip through Asia. We (and they) were a bit shocked by the difference between our location and theirs. 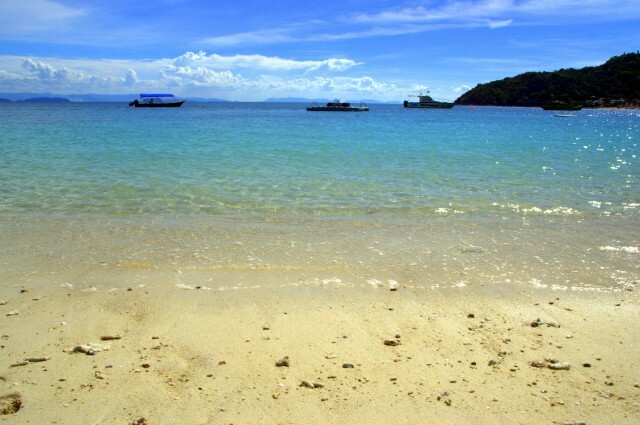 Kecil, especially Long beach at the east coast, is known as the backpackers island. Compared to our clean and quite beach, that one was mega crowded! Apparently the electricity in the hostels is turned off between 7PM and 7AM. Overall, there was a lot of trash and it was pretty dirty. I read that it’s not the same story on the west coast of Kecil (Coral Bay), but keep this in mind when you want to book your stay…. Oh and very important: don’t forget to bring cash because there are no ATM’s on the islands! After our 3,5 day stay (actually minus 1 day because of… How could it be otherwise… Day 2, 9AM: ready, set, go for some tanning on the beach but NO there was a huge deluge during the whole day! Ai, ai, ai, ce n’était pas l’intention!) we were completely reloaded and ready for our next destination: KUCHING, Malay for cat. City of Cats! YES PLEASE!